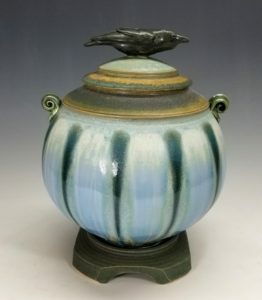 I’ll be at pottery show in Demarest, NJ Nov 30 and Dec 1-2. Then back to the studio for our annual open studio and sale on Dec 8-9. If you are interested in my work, or Carolyn’s, we’ll be in the studio everyday through til the holidays. Just give a call or an email to let us know when you’re stopping by. I have to admit that it is getting harder and harder to get excited about loading my portable gallery into the van and getting up really really early in the morning at far flung locales to set it up and sit out the weekend, whether raining or in the sun. 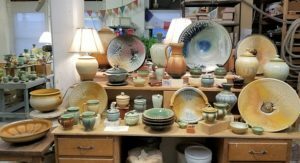 I am going to be activating my etsy shop again shortly to try to accommodate out of town customers, and generally encourage in town residents to visit our studio showroom, where you can see scads more pots than will ever fit into our show booth. After 43 years of doing outdoor art shows, it feels like it is time to gradually withdraw from that scene and leave it to the younger folk. Stay tuned, I’ll put the etsy link up when it is ready to go. I am a full-time potter working in Rochester, NY. 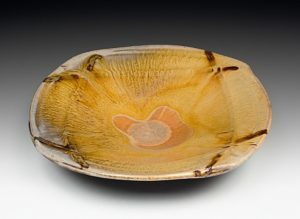 I have been making my living in clay since 1979, and produce a range of stoneware, ash glazed and single-fired, which is suitable for use on the table and around the house. My work is available to see and purchase in my studio showroom, at galleries and art fairs around the country, which are just a mouseclick away on this website.